Recently, WISER was invited to the Mars Area High School where 10th, 11th and 12th grade Anatomy and Physiology and AP Biology students experienced simulation first hand. 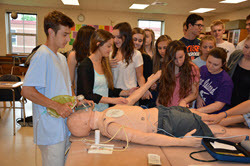 Approximately 130 students participated in seven sessions geared to expose the students to healthcare simulation while reinforcing classroom activities from the Cardiology and Respiratory sections, and CPR training the students received during Health class. Specifically, the students reviewed cardiac electrical and mechanical activity, and airway anatomy. They also had an opportunity for "hands-on" experiences with an AED (trainer) and bag valve mask ventilation. Application of the subject matter to the hands-on learning activities proved especially valuable when the teachers revealed that the covered material will be on their final written examinations. The students were very impressed with the simulator capabilities and were excited to use the same technology that "real doctors and nurses" learn on. Many students commented that the school should have one of these simulators for use in the classroom setting. The sessions were so well received by the students and teachers that planning is already underway to come back for the 2014-2015 school year.